From year to year a great number of ingenious ideas appear. Some of them may seem stupid and useless while some are really a great treasure for many people. But often the majority of such inventions can be both stupid and useful. How can it be? For example an umbrella with a cup holder. From the first view this is nonsense but a little bit later you understand that it is GREAT. The same applies to floating coolers. Of course this invention is not vital and you could live perfectly without it, but such thing as inflatable floating cooler can make your life easier and add fun to your party. The most important moment is that such things as pool coolers are created for party people. Those ones of us who seeks benefits in each purchased thing will not evaluate such “useless” thing. But if you are active and your life is full of fun, parties and relax with friends, than this article is created for you. Sit down and relax reading. In this article our team has picked up a list of various inflatable floating coolers that will definitely turn your party into something awesome and unusual. After comparison of a lot of products we have selected only the most interesting and qualitative variants. This article is neither a tutorial about how to choose a floating cooler nor a number of reasons why you should do it. Those of us who have already decided to purchase such unusual thing don’t need any convictions. So, we recommend the pessimist and downers to close this page and read something else. But if you are interested, active and can’t live without parties – welcome to our review! 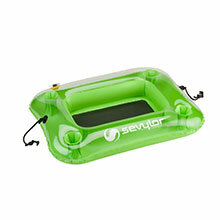 We hope that it will help you choose the right one inflatable floating cooler. Best Floating Coolers. Let’s Compare! TOP 10 Best Floating Inflatable Coolers for You. The first three position of our chart are occupied by Intex floating coolers. These coolers are in a high demand among our users because of great combination of their rather cheap price and high quality. These coolers are durable but at the same time their price is not so high to disappoint you when you cooler will be damaged at the party. 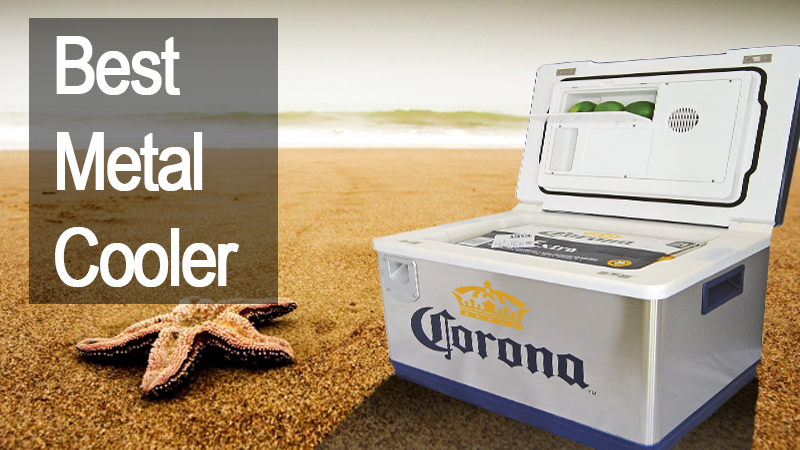 And also, if you are searching for the list of best beach coolers – go here. At the first position we present this floating cooler with the spaciousness of 48-quart and six holders for cap or cans that are built into the cooler. With this cooler you and five your friends can have a good rest. This variant will also perfectly fit for party at the pool. This model of Intex cooler is almost the same as the previous one. The difference between them is in design and a number of holders for cans. 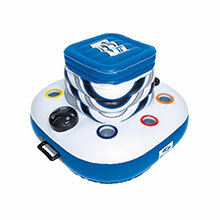 This cooler also has circular design but it is smaller than in the Chill II Float cooler. Also Mega Chill 35-inch cooler has four holders for cups while the previous option has six holders. This cooler is the last and the best representative of Intex line in our review. 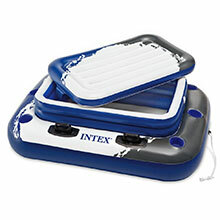 This cooler is equipped with seats for two people and gives an ability to comfortably float down the river or sit in the middle of lake or pool with the cold beverages near you and your friend. Size of 95.5” x 62” makes this cooler the best variant for relax and enjoy your rest. This cooler differs from the abovementioned variants. Firstly the durability and quality of it is higher comparably with the coolers by Intex. This cooler will perfectly suit for one person because its size is not very big. 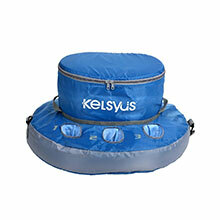 You can accommodate six cans inside the SwimWays Kelsyus. With the weight of 1.5 pounds and high of 16.5” it is very good and portable variant. Made of the high-quality fabric this cooler is definitely recommended to purchasing. For the pool or beach party this cooler will be too small, so we recommend you to consider other variants or to purchase some of these coolers. Well, this cooler is one of the most unique and interesting variants in our list. With the form and colors the same as a traditional fishing bobber this cooler will definitely attract all attention to your company. 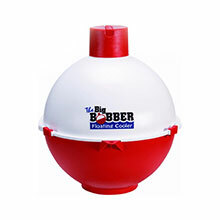 The capacity of this “Bobber” is twelve cans and its measures are 14” x 14” x 15.8”. This cooler is made of the durable plastic and it is not inflatable. Because of this Big Bobber will serve you longer comparably with inflatable coolers but its transportation is a little bit less convenient. One more pros of cooler’s plastic body is its insulation. With such material this cooler will hold your beverages cold during longer time period. Go and check it on Amazon. We continue our list of unique, stylish and fun coolers. 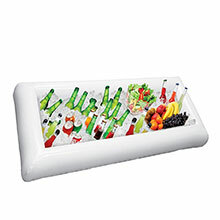 The next representative is this very unusual inflatable cooler which like the previous one will amuse your friends and make your party unforgettable. Circular form of the cooler is more than three feet in diameter and is specially designed to accommodate up to 40 cans or bottles. The main advantage of this cooler is its design. Constructed like an island with the palm in its middle this cooler significantly stands out from the crowd of other floating coolers. But this cooler has a disadvantage too. Despite the fact that it is made of the rather thick material, you should not hope this cooler to serve you during a long period of time. With the best and the most unique design this cooler has the lowest quality among all representatives in our list. This variant will be the best for those people who expect not quality but impression from the cooler. It will fit to the shindig with the crowd of your friends where everyone evaluates its design. 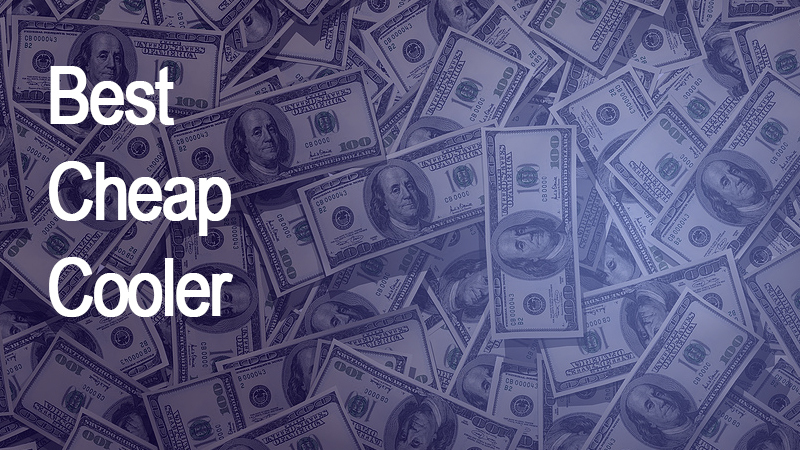 If you don’t want to spend lots of money but want to amaze your company, than this is your pick. 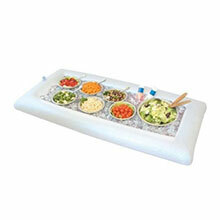 Such type of floating coolers is created specially to hold a beverages, snacks and salads. Of course these coolers are interesting and multipurpose but basically their quality is far from the highest. If you are interested, top quality coolers can be found here. Very important moment while loading such coolers is to spread all snacks, salads and beverages uniformly, in order to prevent its overturn, otherwise you will gather all cooler’s content from your pool after party during a long time. This serving bar has very convenient size that will be enough to place wide variety of snacks and beverages in it. 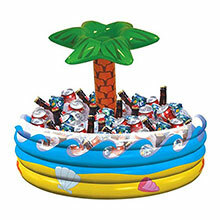 With the measures of 51”x 24” x 4.5” this floating cooler will suit to each party. This cooler also should be loaded very carefully because you risk swimming among pieces of fruits and vegetables that will full your pool in the case of cooler’s tipping over. In fact this variant is almost the same as the previous one. Difference is only in their size. The size of this cooler is 54” x 27”. BPA-free PVC material will allow this cooler float easily in your pool, but as with two previous coolers –don’t overload it! The real party-goers will never pass by this cooler. 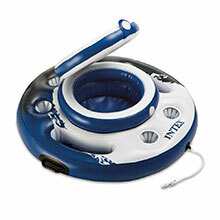 Created for noisy parties in the pool with crowds of people this cooler will conquer heart of every party lover. This floating cooler with speakers is able to hold and chill up to six packs of bottles. With the size of 21” x 15” x 9” and waterproof speaker this cooler will turn every party into something astonishing. Note that this cooler doesn’t have Bluetooth and the quality of its sound is not as good as full-range sound system has. But despite these facts Body Glove Music Station will fit each pool party and provide you and your company with your favorite music.Modern design and unique idea distinct this cooler among others and make it very popular among users. Check it on Amazon. This cooler is created rather as a floating inflatable stand for your cooler than the floating cooler. Actually it is a great idea because this cooler float allows you to take your more qualitative cooler with much longer ice retention period to your pool. Using such cooler float you are able to take your 28-quart or smaller cooler or ice-chest to a pool and provide your friends with cold beverages during many hours. As a conclusion we want to say that such type of coolers as inflatable floating coolers is created more for fun and convenience than for long-term use. Don’t expect these coolers to serve you during many years, but you can be sure that with such cooler your party will be full of joy and gladness. Of course the quality and ice retention of these coolers are far from Yeti coolers’ (these are) for example, but their price and variety of designs allows you to change them from party to party without any significant money spent. 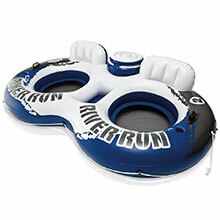 >> Check out all floating coolers available on Amazon .